I've been using EWW and I noticed that it displays inline LaTeX expressions ($ ... $) but it fails to display those that have their own line ($$ ... $$). I'm attaching a print below. Have a look the blank space after the sentence "Symbolically, ". Is it possible to display those $$ ... $$ LaTeX formulas? Can I choose whether I want to see the LaTeX code or the rendered version? Looks like this is bug#24111, which was fixed for Emacs 26 in "Fix rendering of some complex SVG images" of 2017-01-24. "Hackaround for bug#24111 in Emacs 25." Not the answer you're looking for? Browse other questions tagged latex images eww or ask your own question. 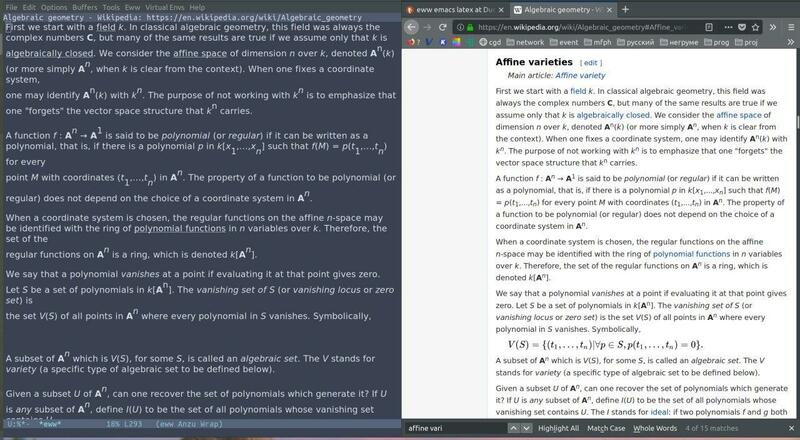 How to copy latex equations as word equations from emacs?